Winter has come early to New England. Just the other day I heard a weatherman say that this has been the third snowiest November in Vermont since records have been kept. That said, there is still plenty of fall work left to do here on the Franklin Farm. For quite some time I have contemplated writing a Franklin Farm blog. As winter sets in, it seems as though this may be as good a time as any to begin. Few people make their living farming anymore. If you have never lived this way, or known relatives that did, you might find this blog interesting. In these entries I will shed light on my family's work and our commitment to the animals we partner with here on the Franklin Farm, as well as the diverse, beautiful and productive land that supports us all. I encourage you to comment and ask questions. I will do my best to respond. *You can use low fat or skim milk but you will have to add another Tbsp. of oil. ** These pancakes work really well with Bob’s Red Mill 1:1 Gluten Free flour. 1. Mix wet ingredients in a medium sized bowl. 2. Mix dry ingredients together well. 3. Combine wet and dry. Stir well. If too thick, thin with a little milk or water. Add fruit if you like. We like blueberries and/or raspberries. Another favorite is apples and cinnamon. Generously oil a griddle or heavy fry pan. Drop batter by the spoonful into hot oil. Cook on first side till bubbles appear and edges look a little dry. Flip and cook a minute or so more. 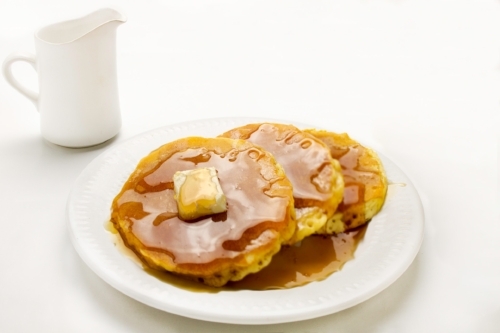 Pile on a plate and serve with plenty of Franklin Farm Maple Syrup.